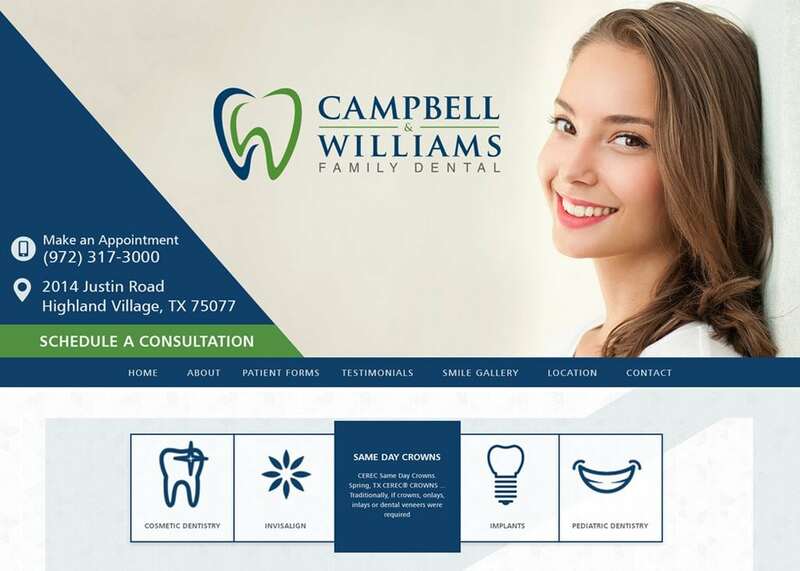 Campbell & Williams Family Dental came to us nearly at their wit’s end, having tried to come up with a design for their website that fits both their budget and their vision. They had worked with other developers but hadn’t quite come up with something they liked. We sat down with them and talked out the details of their vision, and when we presented them with the result, they asked for just a few minor changes before announcing they were ecstatic with the results. It started with a simple selection of color, followed by a consideration of design elements that would produce a flowing style that would be beautiful on both PCs, phones, and tablets. Throughout, they wanted it to hold to a warm and welcoming feel, something that would resonate with individual patients and those bringing in their families alike. It needed to be immediately welcoming and inviting for those who had little time and had to make a snap decision while having enough meat to educate more inquisitive and returning patients as well. Blue and Green and White come together in the design of this page in a way that is distinctive for Campbell & Williams, even though they are old friends in medical websites. Green and blue are both colors that signify hope and growth in the human mind, and white comes along with its notes of professionalism and purity, a fresh new start with a sweet new smile. We used these colors both for the way they compliment each other in a visual display that’s frankly striking, as well as for the subtle undertones they send to the viewer to show them that this is the kind of website they’re looking for. From top to bottom this design flows and is formulated to draw in the viewer and welcome them to the Campbell & Williams Family Dental community. It starts with a warm and welcoming smile from the face for the organization and flows down through a series of compartmentalized sections that address the services the clinic offers, an introduction to the staff, and testimonials from those who came before. One exciting design approach used on this website is the use of icons rather than images for the service links, we feel it helps avoid a sense of heavy-handed marketing while still drawing the eye. From the opening view, this site is inviting you to decide to book immediately without the inconvenience of a phone call. The header follows you down the page as you research the site, meaning you don’t have to look for the booking button when you find the bit of information that makes it perfect for you. As you approach the bottom, you’ll see the links to their social media as well as another invitation to make an appointment with them. This website comes together to display a welcoming environment for families in need of dental care. It’s uncomplicated and straightforward, precisely what your visit to the dentist should be. Patients who visit this site will be drawn in by the simplicity and welcoming atmosphere it puts forth.